Not every case of periodontal (gum) disease begins with noticeable symptoms. But for those that do, some of the most common symptoms include sensitive or irritated gums, redness, bleeding, frequent bad breath, and a receding gum line. 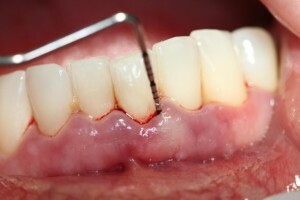 In more advanced cases, patients may notice pockets between their teeth and gums, and possibly one or more loose teeth. If left untreated, you may end up losing teeth and/or experience other serious oral health complications. We will help you understand your needs and recommend a treatment plan that will work for you. Maybe you need to have better hygiene by brushing and flossing more each day, or perhaps you need more advanced care within our hygiene program. In extreme cases, you may require surgery and be referred to a Periodontist (gum specialist). Regardless, we are happy to help you with a treatment recommendation. Afterwards, if you have questions about the plan we’ve recommended, we hope you will let us know. We want you to feel fully comfortable with the plan that we recommend for you. If you have any questions about Periodontal Therapy, please contact us.